Monday, April 30 is designated to national holiday called Queensday. The whole country goes nuts, everybody dress in orange, drink and enjoy themselves. 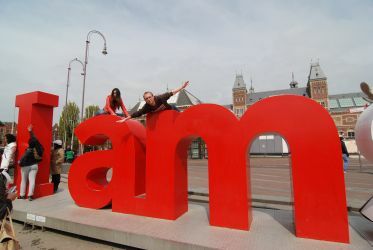 I used the long weekend to visit my friend in Amsterdam and spend the Queensday there. I was in Amsterdam in July 2008, but to be honest, I do not remember much. I made a lot of pictures, because I had my camera for a short time and was really excited. I don't remember any more, where we stayed, just that the weather was not so good and I liked the bridges and canals in the city. That was 4 years ago, now I have been in the Netherlands since September 2011 (I went back to the Czech Republic three times) and I haven't been in Amsterdam. I postponed my visit until Katka (my fellow student from Charles University) went there for Erasmus exchange so I have a place to stay, a guide but mostly someone to walk thought the city and spend the time with. I planned my visit for long weekend including the Queensday. In 2012 it's celebrated on Monday, April 30. So let's go to Amsterdam! The best Carnival? In Maastricht! Carnival - special event when people dress up into funny and colourful costumes, drink and have fun. Exactly this happens in Maastricht every year and as I am here, I could not miss it. I experienced something incredibly cool and atmosphere in the whole city was just fabulous. I was never a big fan of Carnival as I never had a reason to be. Maastricht is famous for holding up to the tradition so the only thing you can do to avoid Carnival is to get out of the city. Not my case. I was curious what it's gonna be. 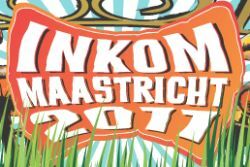 As I reported in November in article The beginning of the Carneval season, the Carnival in Maastricht changes the city. Really. And it was just a small introduction in November compared to current event. 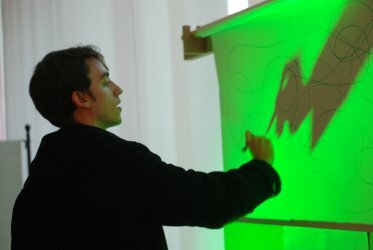 Preparations took several days – shops with big show windows put wooden boards for protection, different stuff coloured green-yellow-red decorated in the whole city. 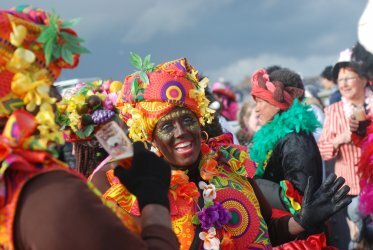 But what you could not see were the preparations made by the people – they created costumes, masks and carnival vehicles. I invited a friend who is now for exchange in Brussels to see it and she came with 5 other friends which was awesome. Happiness is real when shared So let's have fun! Museum in Maastricht opened its door for free today. I wasn't there before so why not use this initiative from the City of Maastricht and have a look what this place has to offer. I also met there some friends from the Art faculty - what a nice afternoon! The Bonnefanten museum is located at the riverside near Kennedy bridge. I met there with Zuzka at 3 p.m. I took my backpack for camera with me, but I was forced to put that in the security locker. Next time, I will take only small bag only for a camera. I took the programme brochure and realized, that there are also workshops and performances. We missed one just only because they started earlier! Never ever happened to me, that something starts sooner than scheduled. We weren't allowed in, so we decided to walk around and see what is in the museum. My overall impression of this place is that this place definitely not fit into my definition of a what a museum should be as such, meaning collection of historical artefacts. This is obviously an art gallery or I got something wrong. Friday was last day of INKOM, therefore a bit restful - the target was to relax a bit and strengthen social contacts. And what it Cantus? It is party, a lot of bier, songs and a lot of fun! The last day of INKOM started later than the others – we met at 12 at Stay Okay Hostel, where we got a sandwich and could enjoy some of it's facilities. Well, too much people and too little facilities (two pool tables?). So we talked and went to watch some movie. Then we moved to the MECC for Cantus. It's a Dutch tradition, people drink beer and sing songs. 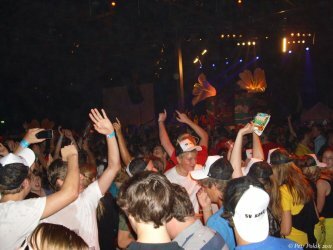 It's kind of a party, but you have to be prepared, than when you leave, you will be wet and stinky from beer as people also throw cups with it to the crowd. It was fun, as most of the songs were in Dutch MECC is really huge place, I cannot estimate how many people can fit in there, but definitely everybody from the INKOM. That's the reason why also the final party was there. There is special week for incoming student for the whole Maastrichtu University. Four days to get to know Maastricht a bit more, get some friends before the school starts and also get some information about the university. That's what INKOM is about. The registration for the INKOM started at 10 a.m., so I wanted to arrive there for about this time. My brother our our friend drove me there and I was astonished by the building and all the people. Wow. There were so many people waiting in a queue, obviously everybody wanted to be there on time. I had to wait for about an hour in a line, so I had time to observe people around me. A lot of German speaking people – I didn't know before, that there are so many of them, but it's understandable, as Maastricht is close to Germany. Then you can clearly distinguish people from any student association, as they wear colourful costumes or are just united by some kind of uniform.